TEN MINUTES OF REBOUNDING IS AS EFFECTIVE AS 30 MINUTES JOGGING!! The atmosphere and endorphin rush is just addictive… you just want to keep partying all night long. Everyone needs the ‘feel good factor’. Bouncing on a rebound has been shown to burn between 400 to 600 calories in 50min. Bouncers are amazed at the speed of their weight loss and fantastic changes in their body shape. When you are tired and emotionally challenged after a hard day at work the Boogie Bounce programme just revitalises you, totally eradicates your stress and makes you feel on top of the world. 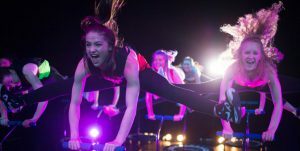 Bouncing on a trampoline absorbs much of the impact or shock on each bounce, thereby making this kind of exercise programme very much more attractive to those who need to avoid shocking or straining their joints, soft tissue, and skeleton. The programme has been known to help rehabilitate injuries and help individuals get back to full fitness. Bouncing is said to greatly increased lymph fluid circulation, leading directly to a boosted immune system, greater white blood cell activity, and increased detoxification. Some of our class attendees have noticed incredible cellulite reduction. Bouncing is said to directly yield impressive aerobic exercise benefits in terms of heart strength and functioning, respiration, and related physiological functions. Bouncing is often said to improve all of these no end thus resulting in a massively improved life style.